Educated at Orange Public School and Newington College, William James Dunbar completed his theological training in 1910, and served in the Methodist ministry in Coonamble, Gilgandra, Kyogle and Tilba prior to his enlistment in August 1915. He had also spent six years as a part-time member of the 1st Regiment and 3rd Regiment. William embarked for Egypt in September 1916 where he was assigned to the 12th Light Horse, but also spent some time with the 4th Light Horse. In May 1917 William was promoted to Chaplain Captain 4th Class. He took part in the Battle of Beersheba with the 11th Light Horse in October 1917. During the afternoon a call was made for stretcher-bearers at the 11th Regiment’s headquarters just south of the wady. Chaplain W. J. Dunbar the regimental ” Padre,” an Australian Methodist clergyman who had joined the light horse as a trooper and had been promoted in the field, was among those who at once volunteered. Crossing the wady on his horse Dunbar rode forward under heavy fire, the one horseman on the landscape, to some little straw-stacks, where he engaged in dressing a number of wounded men. While he was there Trooper W. P. Forster,’ who had been with Brierty and had been only slightly wounded, rose from amidst the mass of dead horses, and, avoiding the Turks, ran towards the wady. Dunbar, despite the protests of a few men at the straw-stacks, at once dashed out to meet him. As Forster ran, the German machine-gunners opened fire. For some time the bullets cut up the dust close behind him; and, as he went on unhit, and the chaplain ran to join him, every Londoner and Australian lying on the exposed slope and breathlessly watching the two men, prayed for their escape. Forster was hit and fell. But he rose at once and, staggering on, met Dunbar; then both men, coming under a stream of bullets, were killed. [Dunbar] was killed instantly while endeavouring to bring in a wounded man – all day he had been up in the firing line with our Squadron and evoked the admiration of all the men. Captain Dunbar was buried the following morning alongside 12 others who were killed during the battle. 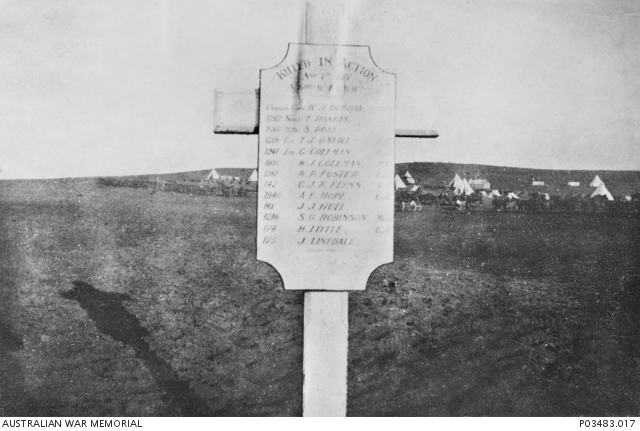 The 11th Regiment later erected a cross on the gravesite bearing the names of the fallen. William James Dunbar, unselfish, manly, devoted to duty, was killed in Palestine when bravely trying to rescue a wounded trooper. These brethren have, as the soldiers say, ‘gone west.’ They are beyond the rude ‘alarums of war. Their bodies lie in soldiers’ graves in far distant battlefields. But their ‘Last Post’ has been followed by the ‘Reveille’ of Heaven, calling them to the larger service of the King of kings. In 1923 the Anzac Memorial Avenue of trees was planted along Bathurst Road to commemorate fallen WWI soldiers. A tree was planted in honour of “Rev WJ Dunbar”; it was donated by Tom Hawke. Very few of the trees are still standing today. 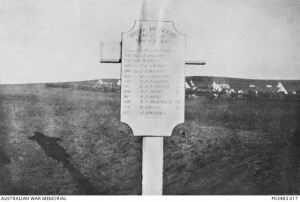 Commemorative plaque erected in the memory of 13 men of the 11th Australian Light Horse killed in action 7 November 1917 near Gaza, Palestine. Image courtesy Australian War Memorial. This entry was posted on February 4th, 2016.